This article arose out of a series of conversations with a student about horary predictions based on a planet’s change in dignity. John Frawley, with whom I have studied, uses this technique extensively and to great effect. I searched for examples of this technique in William Lilly’s work to see if and how he used this technique in practice, and what we could learn from his example charts. Lilly will often note planets’ passage into the preceding or next sign to identify recent or upcoming aspects, and from there discuss past or future events. However, he only rarely points out the change in dignity that comes with a change of sign, and this is our somewhat obscure object in this study. I identified two examples of this practice in Christian Astrology. We will examine both in detail. Date (as given): 4:45 PM, March 11, 1646/7. London, England. Date (modern): March 21, 1647, 4:50:10 PM. This question was asked at the height of power of the Presbyterian Puritans (if that sounds like a fun-loving bunch, you are right) in English politics, when the Presbyterian Parliamentary party controlled much of England, partly through the Presbyterian faction in Parliament and in the Westminster Assembly (1643-1649). This influential ecclesiastical body was formed to debate and establish a new catechism and church organization, and to advise Parliament on religious matters. At the time of the question, the Presbyterians in Parliament wanted to dissolve the New Model Army under the facade of a cost-saving measure, but actually motivated by animus toward the Army and Oliver Cromwell. King Charles I was already under arrest and had rejected a settlement with the Presbyterians. Cromwell’s New Model Army seized Charles and marched toward London to shift the balance of power to their side. Lilly does not spell out the exact implications of the sign change, but to an astrologer, his meaning is clear; the Presbytery will falter due to Jupiter’s change of sign and concurrent loss of major dignity (Jupiter is exalted in Cancer but holds no corresponding dignity in Leo); entering into the terms of a malefic, and encountering malefic fixed stars. The problems for the Presbytery do not stop there, however, as Jupiter travels through Leo, he will next enters the terms of Mercury, a planet strongly influenced by other planets, which is currently in its sign of detriment and fall and in the decan of Mars. We can see that Lilly moves Jupiter around the cosmic game board and examines its condition throughout. Note that he only moves it forward a couple of terms, a guideline for those of us tempted to move planets forward a few signs until they enter major dignity. Next we have another example, where the change of dignity is kept as a side-note to the main question. Date (as given): 31 March 1634, 6:00 PM. London, England. Date (modern): April 10, 1634, 6:02:25 PM. If I should purchase Mr. B’s houses. 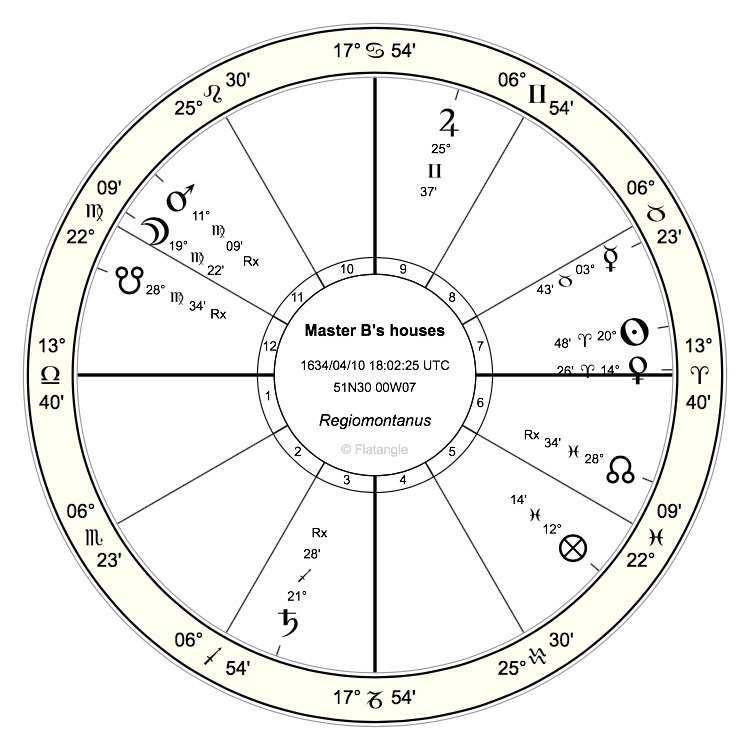 This is one of Lilly’s more famous horaries, as it concerns his purchase of the house in which he was living. We will only go into the part of the chart that concerns a change of sign, but the entire chart and Lilly’s analysis is recommended for further study. What can we learn from Lilly’s examples? He uses the change in dignity sparingly, and both examples listed here utilize Jupiter. This is not to say that you can only do this technique with Jupiter, but you will notice that Jupiter is a superior planet that changes signs only once a year. Lilly does not pay attention to upcoming dignity changes of the inferior planets, which is far more frequent and therefore less special. Jupiter and Saturn change signs infrequently, so when we see an impending significant gain or loss in dignity by Jupiter or Saturn in a horary, we sit up and take note. The giants move slowly, so each step they take is worthy of our attention. *Well, that is what I call it. Thank you for a very informative piece, Nina! Thank you, Todd! I hope to add more as the year progresses and as time permits. Venus is Lord 3, the absent brother. Thank you for sharing that! Yes, change of sign can often mean change of residence, in this case for the better. I was primarily interested in Lilly’s examples of change in dignity to measure a change in fortunes. In the two examples in the article, he looked at the long-term prospects of the Presbytery party and his own short-term cash situation, respectively. I do notice he used the method somewhat more sparingly than I was taught, which is an important lesson for me. Excellent piece! I’m an amateur, but I have closely examined every Presidential election in history, looking at the signs of each candidate’s Sun, Mars, and Moon, and whether a candidate is a famous commanding general. Victorious commanding generals, as major party candidates, always win. My method picks the popular vote winner or plurality, as in 1824. In two obvious cases, 1824 and 1876, the popular winner was defrauded of the victory….Anyway, my method says that Hillary, with her Pisces moon, is unlikely to win. 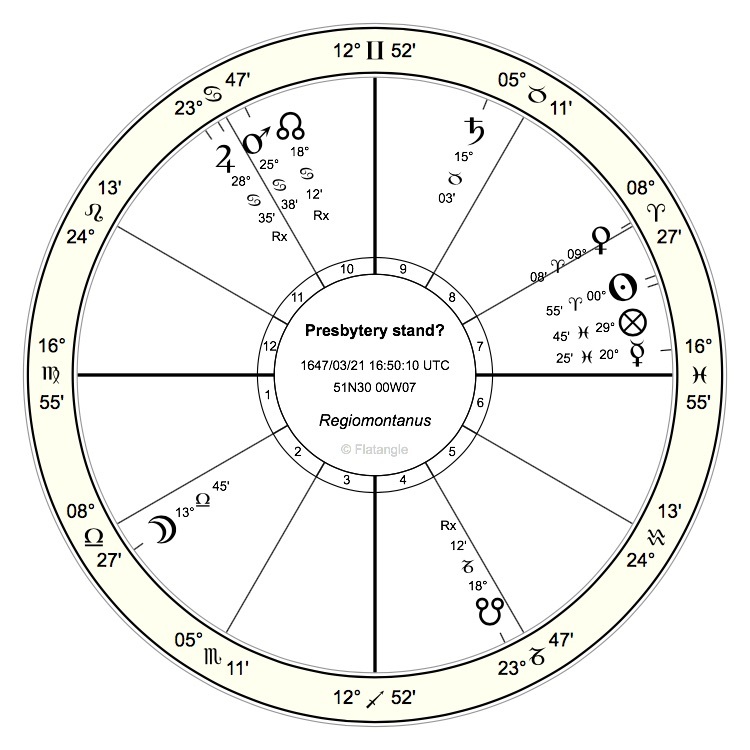 No candidate with either a Pisces moon or mars has ever won, while Grover Cleveland was the only Pisces sun to win a contested election since the Civil War, and his margins were thin….Hence Trump, although his signs aren’t great either for my simple system. Dear Pyrrhus, that is an interesting technique! We will certainly have to see. Whether you use natal methods or the Aries Ingress, one of the concerns, statistically, is that there simply haven’t been that many U.S. elections since the country’s founding.